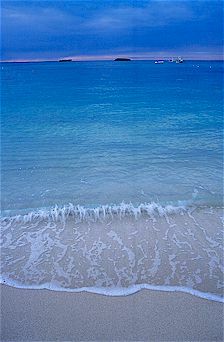 Okinawa is a name that refers to the Ryuku Island chain, a string of tropical islands that runs from Japan to Taiwan. Fortunately, there are some beautiful sights to distract you from morning bombing practice. 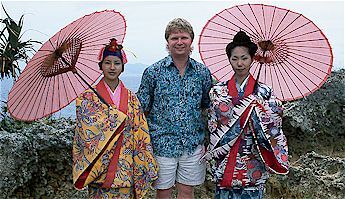 Everything in Okinawa - from the red rooftops to the brightly colored kimono to the sprightly traditional music - reflects the mix of Chinese, Japanese, and Oceanic influences that you would expect. We spent a couple days in Naha, the main city of Okinawa Island (which is the main island of the Ryuku Islands). Naha is a great place to get a bearing on what Okinawa is all about. Kokusai-dori (International Street) is the heart of Naha. There are many restaurants that serve Okinawan food, and many bars and clubs that feature Okinawan music. A little farther from downtown you can find Fukusyu-en, a Chinese garden that's the best I've seen outside of China. 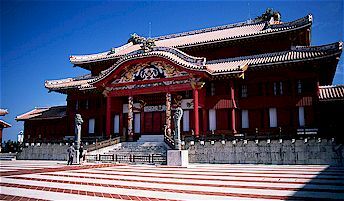 And there's the newly rebuilt Shuri Castle, which was once the seat of the Ryuku Islands. We also enjoyed wandering around the back streets and looking at the traditional homes, with the distinctive red-tile roof. 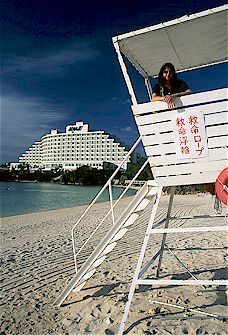 We spent two more days at Manza Beach, which is about an hour north of Naha, on the west coast. It'd be pretty tough to find anything wrong with the Manza Beach Resort (as long as you ignore the mortar practice on the nearby hill, which is pretty tough to do). It's got clear water, beautiful white sand, lots of shells, a perfect sunset view, nice rooms, excellent food, and Japanese service. The water's warm, the sun's hot, and the sake's cold.